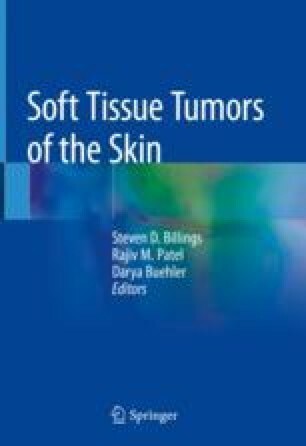 This chapter focuses on a group of tumors that arise from perivascular “myoid” modified smooth muscle cells that invest blood vessels. This family of tumors includes angioleiomyoma, glomus tumor, glomuvenous malformation (glomangioma), glomangiomyoma, myopericytoma, myofibroma, glomus tumor of uncertain malignant potential, and malignant glomus tumor. This group of tumors, consisting of round to spindled cells that invest a proliferation of bland blood vessels, shows significant histologic and immunophenotypic overlap. Indeed, perivascular myoid cell tumors are often hybrid lesions that demonstrate a combination of histopathologic features of the aforementioned entities.